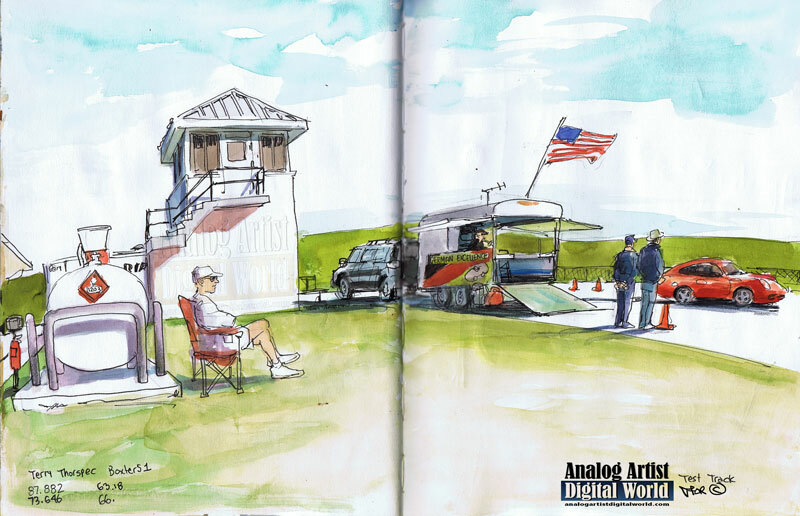 Analog Artist Digital World: Terry's day at the test track. My wife, Terry Thorspecken is a member of a Porche Club. The club has test track outings, driver training and a fun road rally where racers search for clues on road side signs. This test track was set up in a parking lot near a police gun range up north of Mount Dora. From the second we arrived, gunfire punctuated every moment. An SUV pulled up with a trailer that opened up to become the announcer's station. The American flag fluttered in the breeze. Across the road was z grass covered landfill where model airplane enthusiasts flew their high pitched prop model airplanes. Terry rented a driver's helmet which every drive had to wear. She put a strip of tape on her car door to let the other drivers know this she was number 1. Actually being number 1 isn't necessarily a good thing. It indicated that she was a beginner, and this was her first time on the track. At first a driving coach took the passenger seat to give her pointers on how to attack the track which consisted of a series of cones. Each run was digitally timed. The announcer joked during her first run, saying that she was relaxing and taking her time on a leisurely Sunday drive. With all the track noise she couldn't hear the announcer. Her first run was 87.882 seconds. On car did spin out of control at one point, hinting that this is actually a dangerous sport. The car windows had to be open, just, case a driver had to be dragged out of a wreck. After a run, each car then had to line up on a long line to wait for the next run. It is easy to say that the drivers waited far more than they drove. There was always only one car on the track at a time. Terry's second run dropped down to 73.646 seconds and by the end of the day she had her drive time down to 63.18 seconds. Though she didn't get close to the best time for the day, she might has qualified as the most improved driver for the day.